We offer martial arts classes for ages 4 to adults! 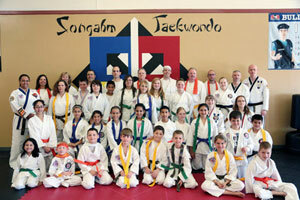 Train in the nation's leading martial arts program and start your journey towards becoming a black belt. Our program is extremely affordable, and best of all, you can try a class, absolutely FREE! We are located just east of Route 34 and Orchard Rd in Oswego, IL. Contact us today to schedule your first lesson. Not only can martial arts offer individual benefits, but it can help bring a family closer together. It's wonderful seeing family members reach the rank of black belt together. "We couldn't be happier with the progress that our son acquired since joining the school in August of 2008. Our son joined at age 4. He consistently shows the love he has for the sport. He continues to improve on his self-confidence and demonstrates a positive example in school. It's amazing witnessing the strides, both as our son, and as a student. The school has molded his attitude and strengthened his confidence as well as achieve great strides at home and school. As parents, we couldn't be prouder!"